Sonic's latest downloadable adventure feels like a Genesis game and looks like a modern side-scroller, but may be the final installment of Sonic the Hedgehog 4. When making the second installment in a franchise, a creator basically has two choices: acknowledge the first entry's weaknesses and seek to correct them, or charge along the same path, usually right into a brick wall. Especially if you happen to be an abnormally fast blue hedgehog, speeding along without stopping to listen to criticisms can prove fatal. The Sonic the Hedgehog series vacillates fairly regularly between gaming's favorite punching bag and one of its treasured nostalgic properties, so many gamers enjoy trashing a disagreeable new Sonic game almost as much as playing through one that meets their high standards. For this reason, Sonic the Hedgehog 4: Episode I left gamers in a bit of an awkward position: It was the return to the Genesis classics they had been clamoring for, but some things still didn't sit quite right about it. With a redesigned engine, polished graphics and animations, and the option for cooperative play, Sonic the Hedgehog 4: Episode II may end up pleasing Sonic's almost unpleasable fanbase - even if the future of the series remains murky, at best. The demo for Episode II begins in the overgrown ruins of Sylvania Castle (the developers are big fans of all kinds of classic platformers), and should look familiar to anyone who's experienced Sonic's adventures on the Sega Genesis or their numerous re-releases. The titular erinaceomorph starts on a flat plane at a standstill, but by moving him to the right, players can build up speed until Sonic careens through the level at a full tilt. 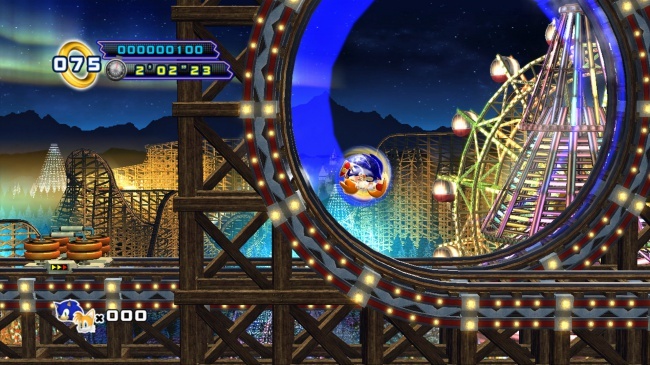 Once he reaches top speed, Sonic can cruise through loop-the-loops, add distance to his jumps, and even sprint across water, like some kind of messianic insectivore. This all sounds simple enough, but momentum is the name of the game here, and there are plenty of things that can slow Sonic down. 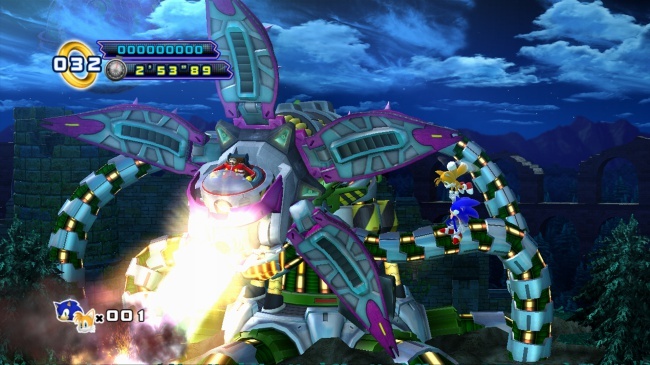 A variety of enemies stand, sit, or fly between Sonic and the stage exit, and even something simple like missing a jump or not building up sufficient speed can divert Sonic from his preferred path and into the lower reaches of the stage. 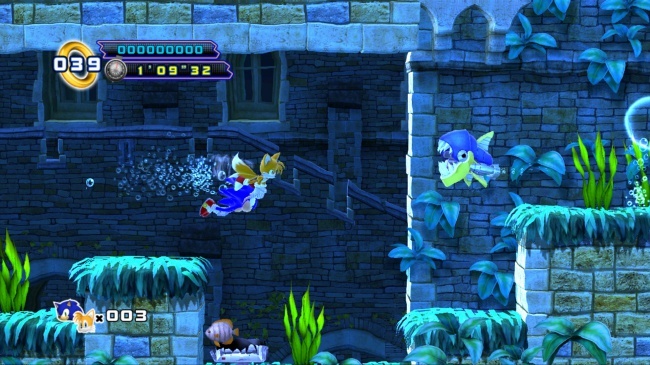 This seldom results in death, but often slows the action down considerably as the player must exercise some platforming prowess to bring Sonic back to the main path. Granted, every single thing described so far also happened over 20 years ago in the Genesis games, so Sonic is hardly racing over new ground in this installment. However, a few tricks from Sonic's 3D games have transitioned into Episode II. As in Episode I, Sonic has a lock-on attack that allows him to home in on moving enemies or altitudinous springs while in mid-air. When he teams up with Tails, his two-tailed fox sidekick, Sonic can reach new heights by flying, or curl into a ball powerful enough to break pieces of the environment and reach new areas. While the game has not fundamentally changed since Episode I, the big difference comes in the feel rather than the objective mechanics. When many fans expressed displeasure that Episode I did not control like a traditional Sonic game, Sega took their complaints to heart. "We could have used the same engine, but we listened to fan feedback," says Ken Balough, the brand manager for Sonic the Hedgehog 4. "The Sonic brand has a very diverse and sophisticated fanbase." Balough explains that the two most prominent fan requests for Episode II were longer levels and more coherent physics than Episode I, so Sega recreated both the physics engine and the graphics almost from scratch. In addition, fans who purchased Episode I and Episode II on the same platform will unlock Episode Metal , a mysterious addition to the Sonic the Hedgehog 4 story that will add about 20% of Episode II's length in new material. According to Balough, "We built Episode II more as a 'thank-you' to fans." 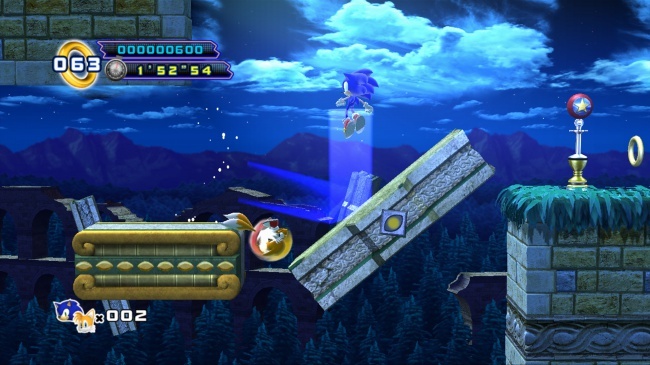 The demo's second level, White Park Zone, helps to demonstrate some of the game's variety in level design. This time, Sonic finds himself on a snow-covered mountain, replete with new enemies, floating platforms, and avalanching snowballs. 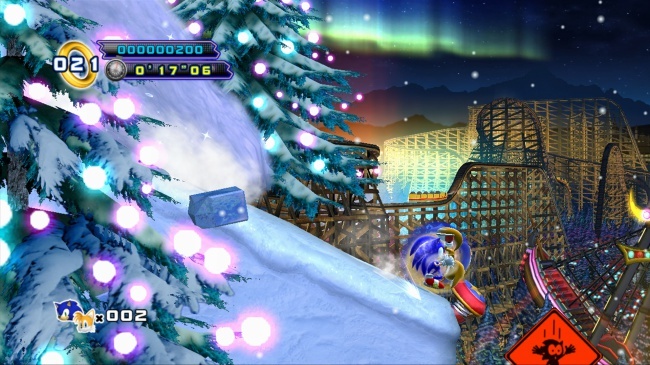 Rather than just running, jumping, and rolling to the end of the stage, this level requires Sonic to time his jumps, outrun deadly snowdrifts, solve simple environmental puzzles, and even hop onto a snowboard to gain some extra speed (and, arguably, style). 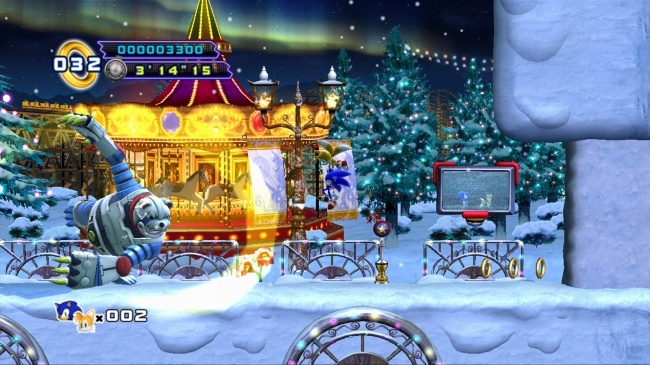 The snow beneath Sonic's feet serves to both reduce his top speed and prevent him from speeding up as fast, so players will be forced to think a bit more strategically while still doing their best to race towards the finish. So far, Episode II looks very much like a spiritual successor to the Genesis titles of yore, with one very notable exception: Sonic's top speed is not what it used to be. The heroic hedgehog hardly runs slowly, but compared to the Genesis titles where the camera could hardly match Sonic's progress, Episode II seems a little sedate. This does not diminish the sense of urgency, but it does help the player slow down to take a look at the attractive, branching level design and detailed characters, and perhaps plan out alternate routes for future stage runs. Whether or not this is worth the sacrificed speed is an individual preference, but Sonic's new pace will take some getting used to. 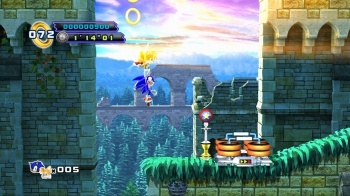 The game is currently slated for May 15, 2012 on most major digital platforms, but this may be the last players see of Sonic in this particular installment. While Balough admits that there are no plans right now for further Sonic the Hedgehog 4 episodes, it all boils down to finances. "Further episodes depend on the success of Episode II," he says. "[Its sales] will determine the future of digital Sonic. titles." In other words, Sonic fans have what they have wanted for a while now: a real opportunity to shape the future of the series. Granted, it will cost them a little money, but there are definitely worse Sonic games out there to invest in.